SYRACUSE, NY (WSKG) – New York anti-war protesters are taking aim at a defense contractor with offices in the town of Salina. 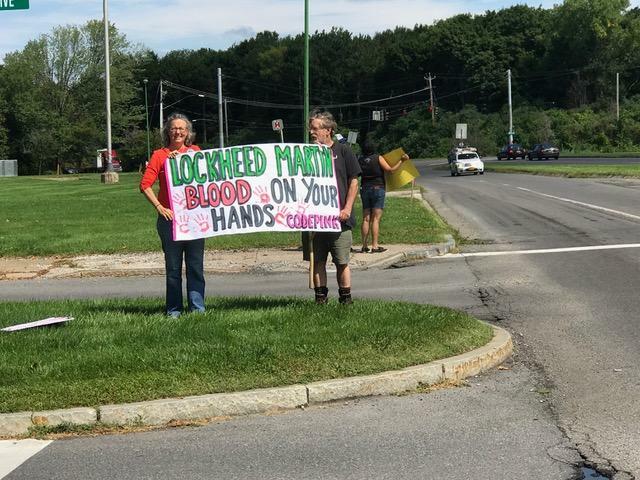 The suburban Lockheed Martin facility is the focus of these protesters carrying signs accusing the company of having blood on its hands. Ariel Gold of Ithaca said a recent Saudi bombing using U.S. made weapons has prompted this gathering. Gold said the the ultimate goal is to divest from a war economy. Ursula Rozum of the Syracuse Peace Council said it is important that central New Yorkers know what companies in their midst are doing. 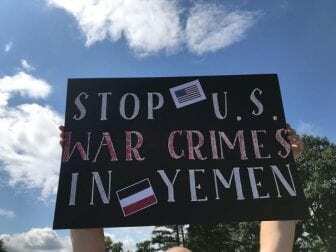 Rozum said the group is also calling for an end to U.S. arms sales to Saudi Arabia. A spokesperson for Lockheed Martin declined to comment on the protest.